The Miami Heat and Indiana Pacers are supposed to be in the Eastern Conference finals this season. Everyone knows it, right? It’s all we’ve heard all season about that weak Eastern Conference; get the regular season over with so one of them will have home court advantage for that seventh game. 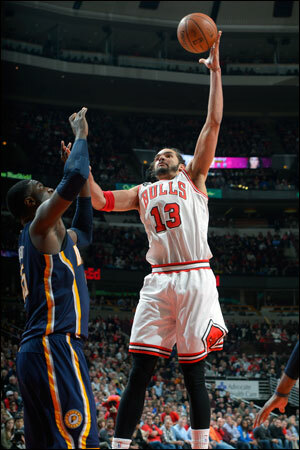 Well, the Bulls with Monday’s dominant 89-77 victory over the Pacers evened their season series at 2-2. The Bulls did that as well a few weeks back against the Miami Heat, winning both final tests as the Heat and Pacers are coming down the stretch playing their poorest basketball of the season while Chicago in going a season best nine games over .500 has the most wins in the Eastern Conference for almost the last three months. “Thank God we got off to such a great start because we’d be like the fifth seed in the East or something like that,” David West told reporters afterward in a somber Pacers’ locker room. Isn’t it how you finish and not how you start that we always hear? In other words, sure you Pacers have the best record in the Eastern Conference now and still are a game away from clinching the Central Division. But you guys are just another team like the Bulls taking aim at Miami, a team having to prove itself, not particularly better or more prepared. And don’t be looking too far ahead because they may be gaining on you. Sometimes the greatest threat is in the rear view mirror. And against all odds the Bulls continue to show that, coming back from Friday’s disappointing loss in Indianapolis with a similar game in opening with a burst to start the second half and the Pacers never much threatening again. Joakim Noah, excited even more than usual in clapping at the ineffective Roy Hibbert on the Pacers’ first play of the game in a turnover, had 10 points, eight rebounds, eight assists, four steals and five blocks. Hibbert was invisible as much as you can be at 7-2 with three points and five rebounds and zero of five shooting. Paul George led Indiana with 21 points, but on eight of 22. Though there was no obvious finger pointing by the Pacers afterward, it was, nevertheless, assumed as they talked about selfish play. And by the way, Lance Stephenson played 30 minutes without an assist and some very curious shots in transition early in the shot clock. Jimmy Butler had 12 points in frustrating George and drawing part of a double technical for conversing with West a bit too openly. Mike Dunleavy had 13 points and eight rebounds in badly outplaying the erratic Stephenson, who constantly went under screens and seemed lost in transition. And it was in one particular transition that symbolized not only the Bulls’ play, but why they quietly are confident no one has a sure road to the conference finals. It was late in the third quarter with the Bulls leading 55-49 after a 14-3 start to the second half behind a run of Dunleavy jump shots. The Pacers responded, and it looked like they were back in the game when George pried the ball away from Carlos Boozer and headed for what seemed like a certain flying slam dunk and just a four-point Bulls lead. Instead, Hinrich, who’d just made a three and is shooting 49 percent on threes since the All-Star break, took off full speed running after George. It seemed the only option was to at least grab George to prevent the dunk. Instead, Hinrich made one of the great defensive plays of the season, stripping one of the game’s greatest athletes and then keeping the ball in play for a Bulls fast break. Sorry, but you just don’t see plays like that. If LeBron James did it you’d see it on the SportsCenter top 10 plays for several months. Hinrich is just hoping to meet John Buccigross some day. But that was just a part of the sequence that epitomized the game. Dunleavy picked up the ball and got it ahead to Butler, who missed. But Gibson was there to follow with a powerful slam dunk, Gibson exhilarated and almost skipping back on defense. The Bulls have those kinds of players and it’s shown as much as ever this season. They lose Derrick Rose unexpectedly; Luol Deng is traded; the team falls seven games under .500 back in December in losing 13 out of 16 games. Season over, right. Give up for a draft pick? Butler is hurt, Noah is slow getting into the season after missing the preseason; they pick up D.J. Augustin after being released. But they never stop believing. And they never stop working and hustling. And, no, no one believes they can compete with the top teams. No one but the guys in the Bulls locker room, which really is all that matters. They’re not the most talented and hardly the most athletic. The only top five lottery pick on the roster is with his fourth team and wasn’t supposed to be starting. But character and commitment can carry you even against the greater talent and reputation. If you have people who are willing to work and have personal pride in their product a team can exceed it’s outside limitations. It’s been the secret, if there is such a thing, for the Bulls these last seasons without Rose. It’s not just defense and slow, physical play. It’s a willingness to sacrifice and do the hard thing. Joakim Noah, excited even more than usual in clapping at the ineffective Roy Hibbert on the Pacers’ first play of the game in a turnover, had 10 points, eight rebounds, eight assists, four steals and five blocks. Though the Bulls had to play it out with a fierce fourth quarter, that late third quarter run seemed to make the difference. After the Hinrich strip and Gibson dunk, Hinrich hit a pull up on a drive and another jumper after a slick spin move. Gibson closed the third quarter with a three-point play, adding his own and-1 signal for a 64-56 Bulls lead after three. Though Indiana, 51-20 to the Bulls 40-31, had chances in the fourth quarter, it really was over after Gibson early in the quarter showed how the teams were different for this night, anyway. The Bulls were frustrated—Gibson said Friday the Pacers were floppers, and Hibbert would rag doll down in one egregious fall Monday—in Friday’s loss. The Bulls had been unusually casual in transition and beaten not only off the boards but in hustle plays. You sensed perhaps fatigue working its way in as it was happening even in the wins, like the two over the 76ers. The Bulls tightened all that up Monday with a 46-42 rebounding edge, ahead on second chance points, fast break points, blocks, steals and assists, the Pacers with just 11 assists overall. They also moved into a virtual tie with Toronto for third in the East. The Bulls last Friday had allowed mostly ineffective Luis Scola to get loose for 19 points, many in transition but also in failing to help on the pick and pop. The Bulls’ defense adjusted Monday. And there was no stopping an energized Gibson, who left the Pacers questioning themselves when he denied George on a switch, forcing George into a missed 19 footer early in the fourth quarter. Gibson then took off and beat every Pacer down court for an alley-oop slam dunk on a pass from D.J. Augustin for a 68-58 Bulls lead. The Pacers now host the Heat Wednesday in the hyped ESPN matchup. But with both having lost their last games to the Bulls and each having lost seven of their last 12, it’s difficult to predict anymore—though everyone is quite sure they will on TV—that Heat/Pacers is any sort of inevitability. It’s two teams stumbling to the finish, which is not the formula for a successful playoff run. The Bulls are hardly suggesting they are the ones to beat. Perhaps just ones not to ignore. Though it was a brutal start for both teams as ESPN stats reported the 34-33 Indiana halftime lead was the lowest scoring half of the season in the league. But Noah was pumped up from the start, clapping his way through the first few possessions and giving Hibbert a nice staredown after blocking a Hibbert shot in the first quarter as the Pacers would lead 19-15 after one. 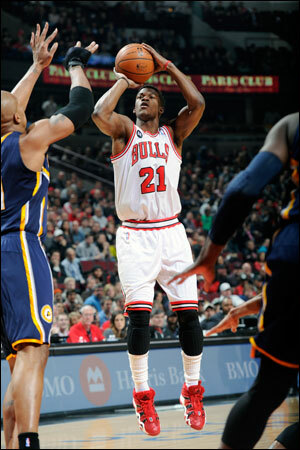 Jimmy Butler had 12 points for the Bulls, who evened their season series with the Pacers at 2-2. “It’s intense,” said Gibson. “Joakim is talking, Hibbert is talking. Lots of stuff being said in the media. I was frustrated. I didn’t like how Scola had 19, 20 points. I wanted to come out and have a better showing on defense. And the offense just came to me. Like Thibs tells me. He says, ‘Teams now are really trying to (stop you); you are getting a lot of attention. They are trying to take you out. You’ve got to be aggressive. This is another step in your development.’ I took advantage. I felt like Jo was getting doubled going to the offense glass and I was going in right behind him. The Bulls survived an early stretch with Butler in foul trouble, though Tony Snell struggled as a replacement. 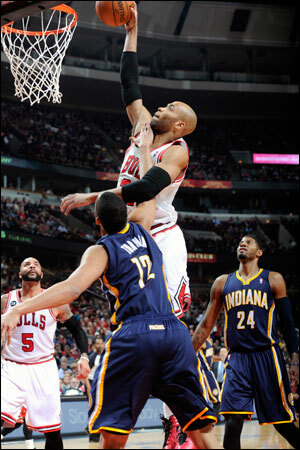 The Bulls then forced the Pacers into repeated jump shots and a lack of ball movement. Hibbert after saying at Pacers’ shootaround earlier nobody flops on his team went down like a sack of potatoes when Noah brushed him across the forehead on a late second quarter foul. The arena erupted in laughter watching the replay. But it was also symbolic in a way as the Pacers seemed to be begging for help while the Bulls were going out and taking it. And we know in most anything in life, the aggressor carries the day. Or night. Who knows where it can lead?